The Good: I have a window seat and no one next to me! The Bad: I have a crazy beautiful in love perfect couple making out across the aisle. The potty smells like a latrine. The bus smells as if the potty door won’t close. Accurately sum it up for ya?! Am reading Book 3 of 3 and don’t want it to end, but, yet, the adventure is just beginning! Do More with LES loves getting these emails! I have been wanting to send you this note since the day you left! I am SO grateful for your help and I wanted you to know I started working in my office the very next work day. As you know, I’ve been working at the kitchen table for months because I couldn’t stand to be in my office. Now, I’m refreshed and my head is so clear! I will definitely write you a testimonial. This note is just meant as a quick note to say, “Thank you” but I’ll write an even better testimonial for you for your website. And, I cannot wait to see you again and have you over for more help! Thank you again, Lauren. Your help meant so much to me and our entire family. This is going to be sappy and sentimental. Period. There are very few people I have known since the day they were born. Sarah Stratton Rodock is one of those people. And she, my friends, and avid blog readers, is a rock star! I started babysitting for Sarah’s family when it was just her big brother J. I remember the night the parents went out and said “Lauren, will you take a picture of us? “She” won’t fit in this dress much longer!” WHAT? Why not?! (I was merely 17!) Sarah was on her way…and on July 11, 1994 her dad and big brother and I stopped at 7-11 for a free slurpee on the way to see her at the hospital! I babysat for Sarah the night of my junior prom, opting to hang out with this newborn rather than go. I’ll never let her live that down. She cried the entire time. I have literally watched Sarah grow up. Every year she impresses me a little more and grows by leaps and bounds. I’ve been her biggest fan, and she, mine. I couldn’t ask for a better friend who is half my age! 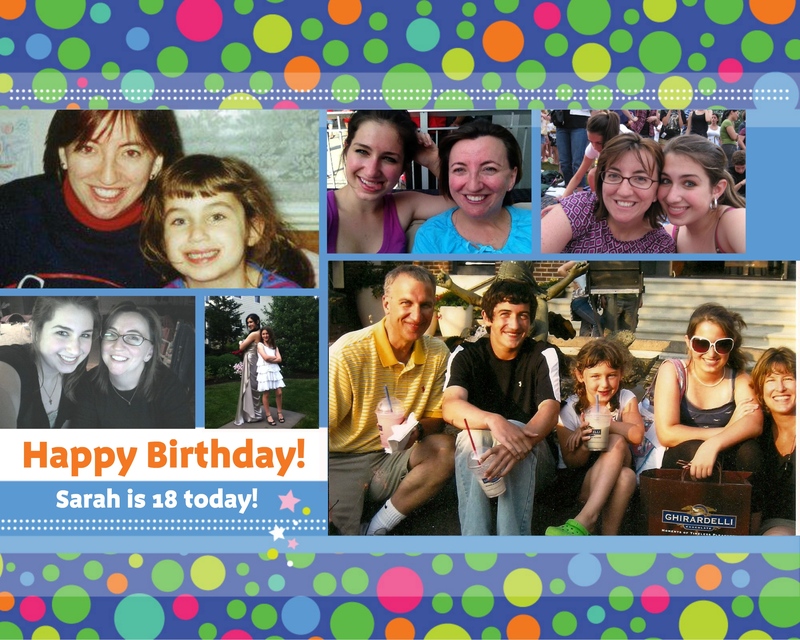 I made this fun photo collage today to celebrate her 18th birthday. Pictures include us at our first Taylor Swift concert, at Merriweather Post Pavilion, which at the time might as well have been the end of the earth, but we didn’t care as we belted out Tay-Tay at the top of our lungs the whole way there….and back! There’s a pic of us from just last week at the throwback Nationals game, thanks to her dad’s season tix! There is a family vacation photo where she is…a rockstar! (Wish I could say I was there and took that one!) There is a pic of Sar and her baby sister on her Senior Prom night! (Shout Out to Sam!) And last but not least, of course, our favorite pic of the two of us on her bed, complete with her PJ’s already on, in November 2000 when I returned from my first job. She wanted Bush to win because after seeing him on the cover of Time, “he’s cuter!” OK she was 6, but Gore won! I am going to embarrass her and put a link to her You Tube video of her signing California. I think the most choked up I’ve gotten over said “rock star” was that night seeing her perform. See for yourself! Lastly, we all went roller skating a few years ago for MY birthday, and no – no videos, sorry! I love you, Sarah-Bear-ah! Happy 18th Birthday, now let’s go register to vote, what do ya say? Six months left in 2012. What’s on your to do list that’s been taken care of? Call Do More with LES today!